Written and performed by Toby Hadoke. Directed by Mark Attwood. 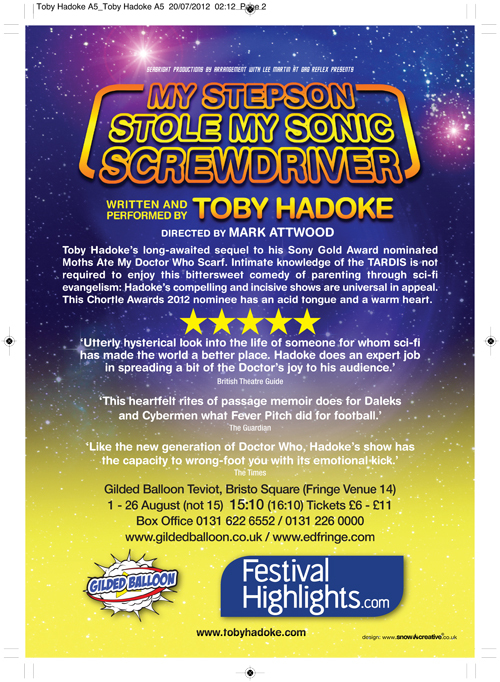 Chortle Award nominee Toby Hadoke’s long-awaited sequel to his Sony Gold Award nominated live show as heard on BBC Radio 7, Moths Ate My Doctor Who Scarf. 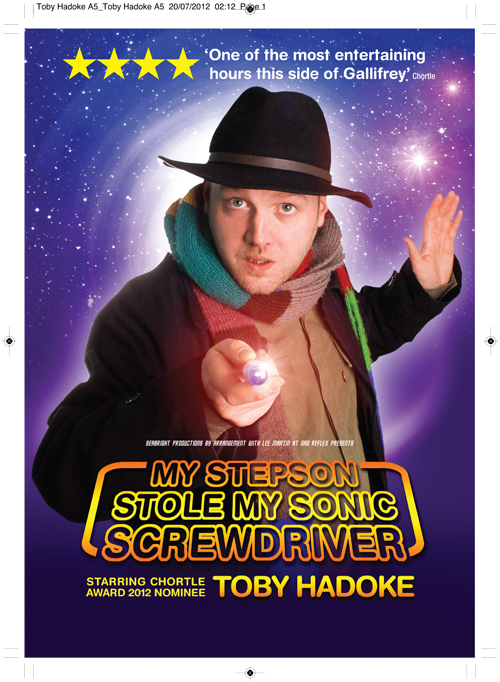 Inspired by an obsession with Doctor Who and picking up where Moths Stole My Doctor Who Scarf left off, Chortle Award nominee Toby Hadoke’s highly anticipated second show is compelling, incisive and universal in appeal. Join him as he takes you on a heart-warming journey that begins with losing a partner, ends with gaining a stepson and pays homage to the restorative powers of the Time Lord in between. Intimate knowledge of the TARDIS is not required to enjoy this bittersweet comedy of parenting through sci-fi evangelism. Toby Hadoke is the highly regarded compere at XS Malarkey, Manchester’s multi-award winning comedy venue. He has also headlined at many Northern comedy venues and is an accomplished serious actor with experience on television, the stage and even in an opera! Toby’s stand-up is renowned for its topicality and occasionally uncompromising political slant. He is a frequent broadcaster on BBC radio, and live audiences can be entertained by him at XS Malarkey and Manchester’s The Comedy Store on a regular basis. He won the inaugural Les Dawson Award at the 2003 North West Comedy Awards, topping a shortlist that comprised of himself, Peter Kay, Daniel Kitson, Dave Spikey, Ken Dodd, Johnny Vegas, Caroline Aherne, Victoria Wood, Craig Cash and Steve Coogan. Technical requirements Basic theatrical lighting and PA. Please contact us via this page with any enquiries or for more details. The long-awaited second Edinburgh Festival Fringe show from Toby Hadoke, the Dawson Award winning creator of the critically acclaimed, Moths Ate My Doctor Who Scarf. Young Toby grew up in the countryside in the middle of nowhere. Sounded Posh, had no money, so was bullied at school for two different reasons. Thus, instead of taking advantages of the delights of the world outside, he immersed himself in the TV – particularly the BBC – and soon became consumed by a fascination for that most taken-for-granted of art forms. For Toby the BBC became an embodiment of all that was great about Britain: intelligent, smart, with a rich sense of history and the shocking ability to put Jimmy Saville on prime time television. He was therefore, aghast as the BBC was pilloried in the tabloids for bias, shocked as the corporation was forced to become ratings conscious, and amazed that Casualty could do essentially the same episode every week. Now, as the corporation is under threat and scrutiny by those with increasing power and a vested interest to remove this national treasure, Toby sends a passionate love letter to an institution we lose at our peril. And slags off Carol Voderman while he’s at it.